I am steaming through the last few blocks before all the Farmer’s wives can have a well earned break. I hope that having these blocks posted with any tutorials or notes that I have written are helpful to you. 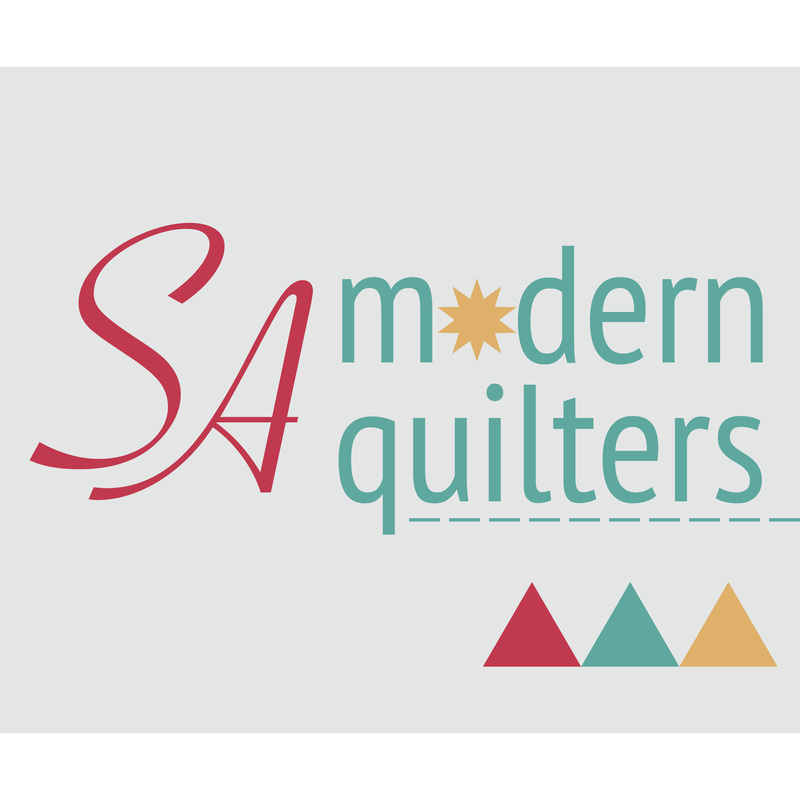 I will certainly enjoy looking back on this process and how much I have grown as a quilter and artist doing these blocks. At times challenging, but always fun. 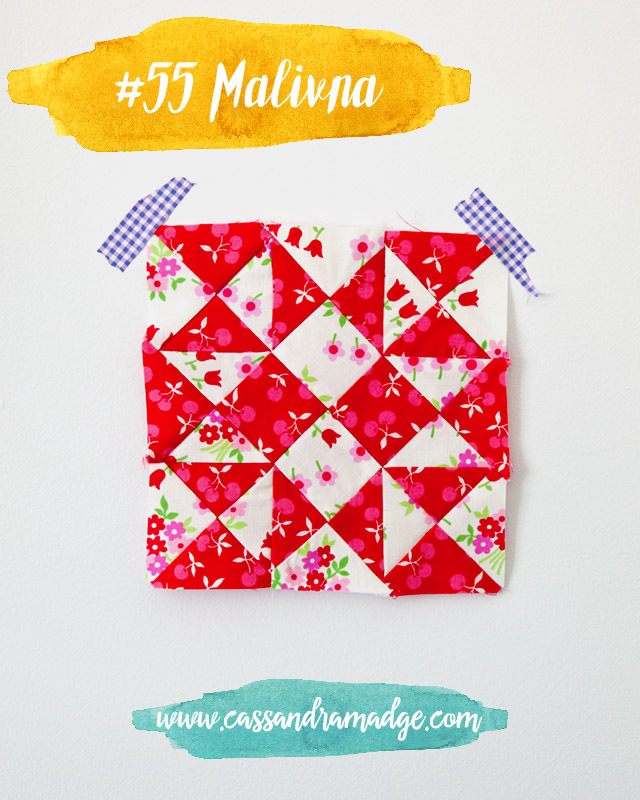 First up this week we had Malvina, which is certainly an old-fashioned name if ever there was one. I decided that my Malvina enjoyed nothing more than stealing away from the dishes for 10 minutes to sit in the orchard and eat fresh cherries straight off the tree. 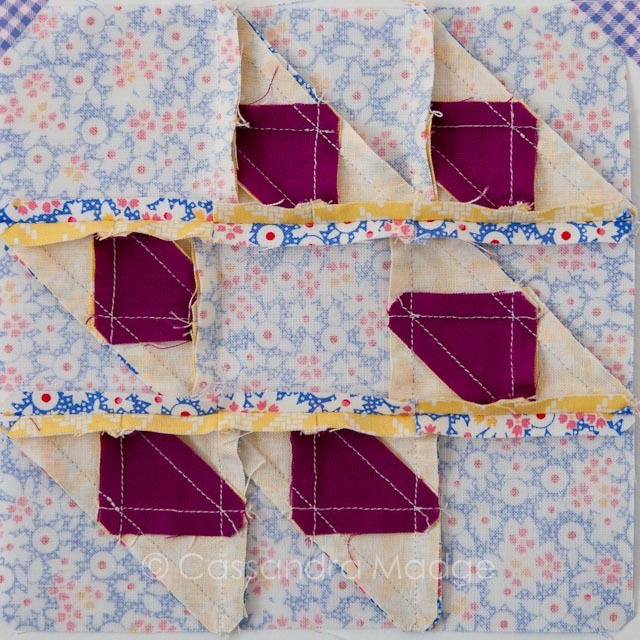 You can find Angie’s tutorial for this block HERE, and Marti Michell has posted a very valuable set of hints on grainline and how to handle these tricky blocks full of triangles HERE. 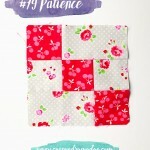 Kerry from Kid Giddy was the official blogger for this block, and her tutorial is fabulous – I highly recommend it! Here is my Malvina block, and as you can see, stuffed very full of cherries. Even though I sat with my printout from the book next to me, with my design board and each piece laid out, I STILL managed to get one set of triangles sewn in the wrong way and had to take out a couple of seams and turn them around. 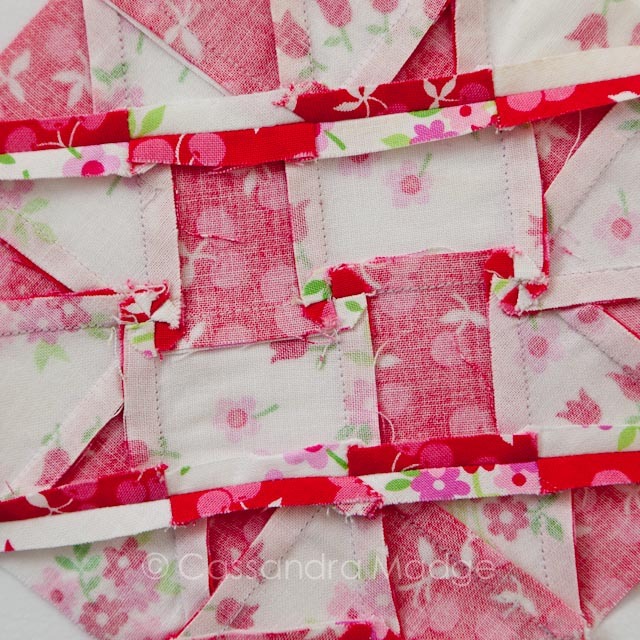 This block is definitely tricky! But I’m really happy with how it turned out, I even managed to keep most of my points, thanks to my careful step by step pressing and nesting seams. 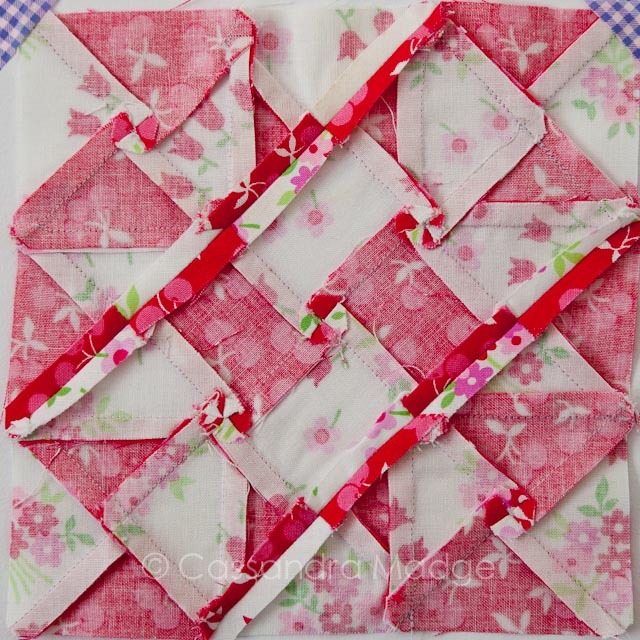 This is definitely one of those blocks that benefit from having the seams spun, or twirled or whichever term you prefer. 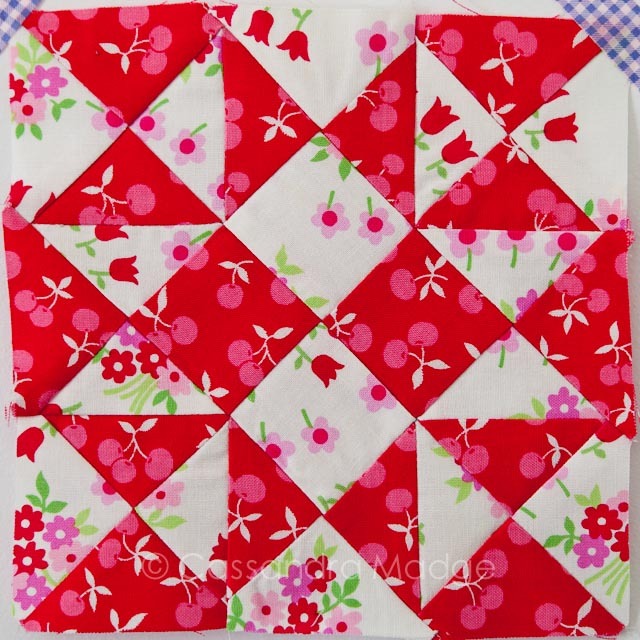 You can see I actually did it to 5 intersections on the back here – three across the middle which I pieced separately to the top and bottom corners and then attached all three together along the diagonal seams. I pressed those open due to the excessive amounts of bulk, even though I was using my Marti Michell templates which help keep the corners neat by trimming them off. 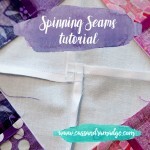 If spinning seams is a technique that you haven’t tried before, or are perhaps intimidated by, please check out my tutorial from a few weeks ago. It makes the idea much simpler and easy to achieve. Next we move on to Cat, which despite her intimidating appearance, I really enjoyed sewing. 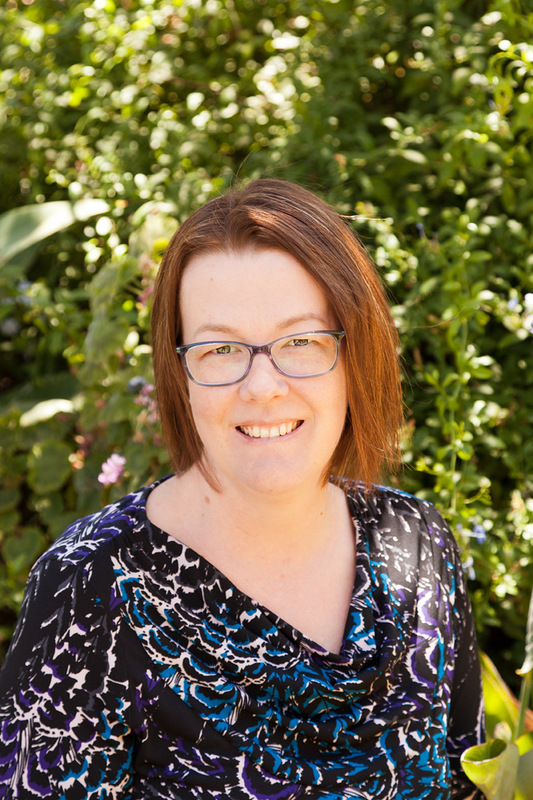 She went together so quickly and smoothly – whether that was just the luck of the day or the benefits of my Marti Michell templates I don’t know. 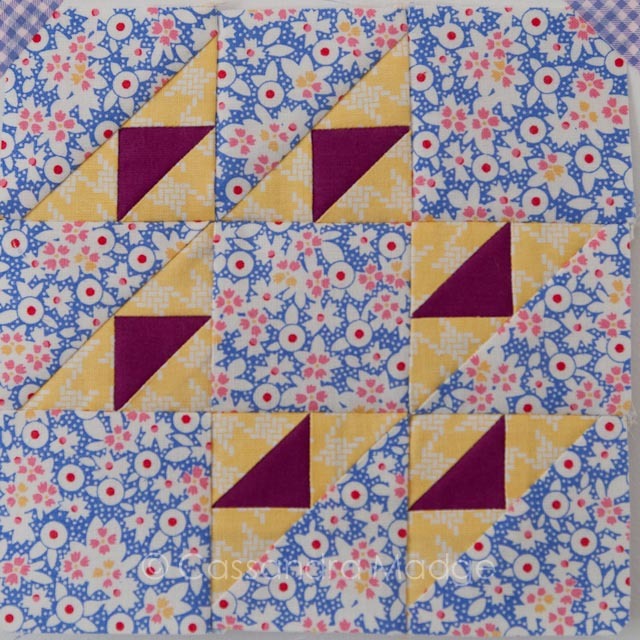 I did have a bit of fun playing with the colours in this block – I wanted to make the most of the contrast between the yellow triangles and the garnet coloured ones that were inset into them. 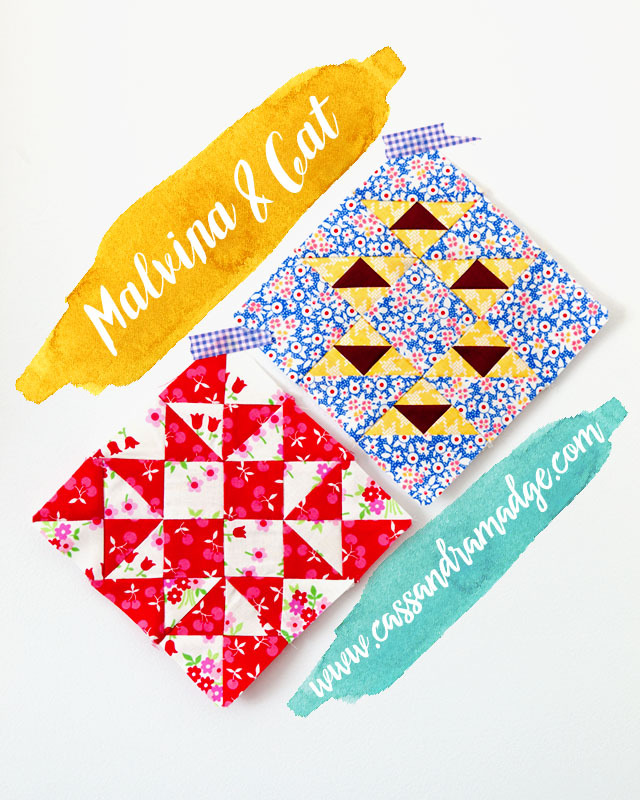 If you haven’t seen them yet, Angie’s tutorial for Cat is HERE, and if you are still collecting the amazing Marti Michell templates, you will find a 20% off code in the tutorial for Cat on Marti’s blog. 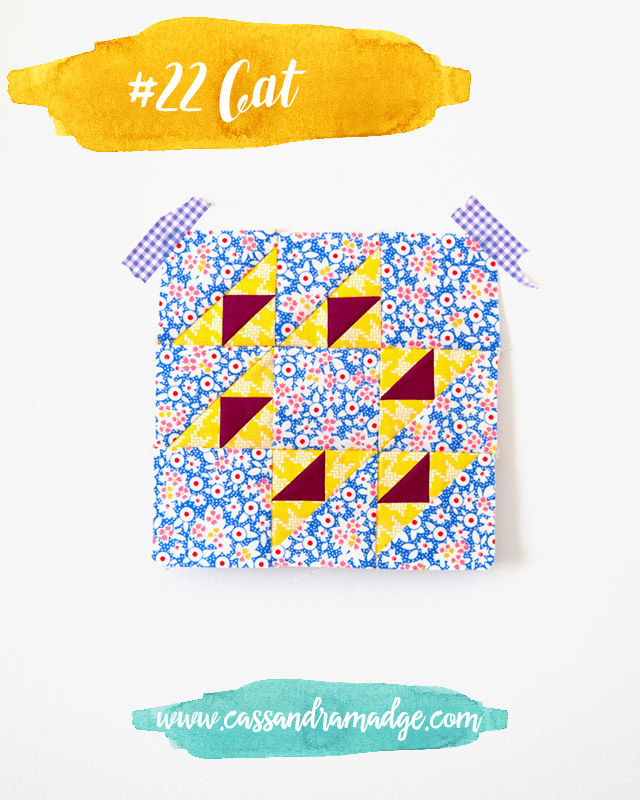 Finally the official blogger for this block is Lisa from Sweet Little Pretties – her sweet version of Cat is HERE. 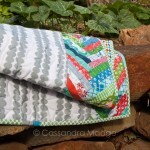 Here you can see my fabric choices and seam pressing a little closer – as I normally do with a 9 patch block I pressed rows in opposing directions so that I could nest the seams, giving Cat her super sharp triangle points. I do love the basketweave print of the yellow Riley Blake fabric, just a subtle hint of pattern that keeps the block from being too heavy or busy. So, we have only one more week of Farming before 2015 is over. I am so excited to spread my blocks out for the past three months and see how they all look together. I have at least one that I might go back and remake, but we will see how well it blends with the others. Are you keeping up? 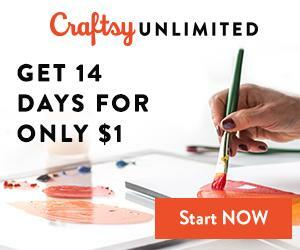 Do you have any blocks you want to remake? 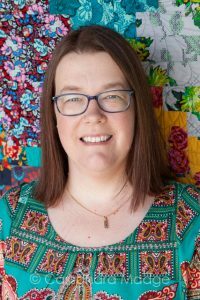 **Disclaimer** I recieved the Marti Michell templates for my participation as an official blogger in the sew along. All opinions remain my own.